The Number Clamp node returns the nearest integer to the Number value in the defined area. Drag the Number Clamp icon into the Node Graph. number A NUMBER type of value. Number Number value. This attribute is exposed as input by default. Minimum Minimum Number value of the range. This attribute is exposed as input by default. Maximum Maximum Number value of the range. 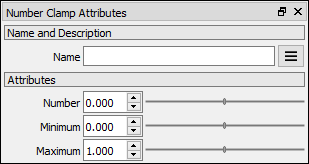 This attribute is exposed as input by default.